HERE is an entirely new quilt that you will want—it's so dainty, different and altogether stunning. Twenty-one butterflies in prints and plain colors of yellow, pink and blue are all in one delightful, rainbow-hued scheme. Or, you may use scraps of your own prints for top wings and plain cloth for lower wings; all different would surely make a quite permissible plan for butterflies. Design number 291, at 20c, supplies cutting design for two blocks, the "profile" butterfly and the bisymetric one facing front. They finish 12 1/2 inches square which is excellent patchwork pillow size. We will supply material and design for a single block in a calico print, a matching plain percale, white and boilproof black, with either pink, blue or yellow predominating. We also include material enough for the back, and cutting design. The side view butterfly is number 292 at 45c, and the one with both wings alike is number 293 at 45c also. State color preferred on single blocks only as all three colors come in quilt top, unless just one is specified. 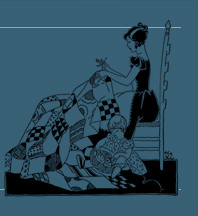 For the entire quilt 9 yards of material are required which includes the white for plain blocks, color prints and plain percales in all three tints, and boilproof black for the bodies. This is assortment No. 294 at $3.15 including designs and materials for the quilt top and border. The butterflies are so simplified as to be quite easy to piece. Antennae or feelers are a black chain stitch and an outlining of black is suggested in the instruction sheet which accompanies each order. Perforated design number 295 at 25c is a butterfly which fits into a 12-inch square exactly conforming to the contour of the patchwork butterfly. 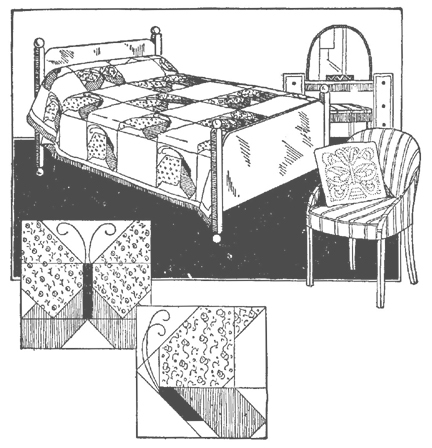 It is shown on the quilted pillow in the sketch, and would be lovely on the 21 alternate plain white blocks using a straight line lattice on the pieced ones.